Hand weights and weighted cuffs are an affordable, convenient, easy-to-use tool for improving quality of life in people with certain physical disabilities such as hand tremors. Explore the various benefits of hand-held weights, and discover their life-changing potential. Hand weights are small, hand-held weights that come in different styles and can be used to achieve a variety of physical goals. Because they are compact and completely portable, hand weights can be stored easily in a closet or cabinet when not in use. There are no complicated instructions or assembly required, and their use involves little or no fuss. As a result, individuals with disabilities who have been instructed to use hand weights at home can generally do so without the assistance of a trained health professional. Avid exercisers use hand weights to build arm strength and increase the cardiovascular intensity of their workouts, while individuals who suffer from disabilities often use hand weights for rehabilitative purposes or to treat particular health conditions. For example, doctors and physical therapists often recommend the use of hand weights or weighted utensils to treat essential tremor, a condition that results in uncontrollable shaking in different parts of the body. Physical therapists have long used hand weights for injury rehabilitation. The added weight can speed recovery when a patient engages in exercises to rebuild strength or increase range of motion in an injured muscle or joint. Additionally, individuals who suffer from hand tremors might find relief from their condition by wearing wrist weights when engaged in everyday activities such as working on a computer or eating a meal. A pair of 2-pound hand weights can be purchased for as little as $13-$16. Adjustable wrist weights range in price from about $13 to $50. There is minimal maintenance involved, but individuals who use the weights regularly should inspect them daily for signs of wear. Weighted cuffs that attach with Velcro or some other closure should be checked to make sure they fit comfortably and remain securely fastened when in use. Wrist And Ankle Weights – This set is sold in pairs at an affordable price. Comes in sizes ranging from 2 lbs to 5 lbs. 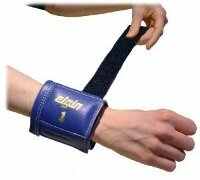 Velcro Weighted Cuffs – A single cuff that has weights below 2 lbs (1/4 lb, 1/2 lb, 1 lb and 1.5 lbs) and up. Even though hand weights can be beneficial for people with certain disabilities, they are not always appropriate. Before using weights to treat your disability, speak with your doctor to confirm that it is safe for you to use them. If you purchase a pair of weights for your home, keep them out of reach of children.